About five years ago, I met an interesting woman online. We lived across this continent from each other; so we never physically met, but for awhile we shared a friendship; then we lost touch. When I decided to write about the concept of soul mates, I wanted to start with the dance of the hawks which she had described to me in one of our conversations. Sometime after she and I no longer talked, I looked out across the creek and for myself watched two hawks perform the same spiralling dance. I already knew what it would look like as I had seen it in my soul. 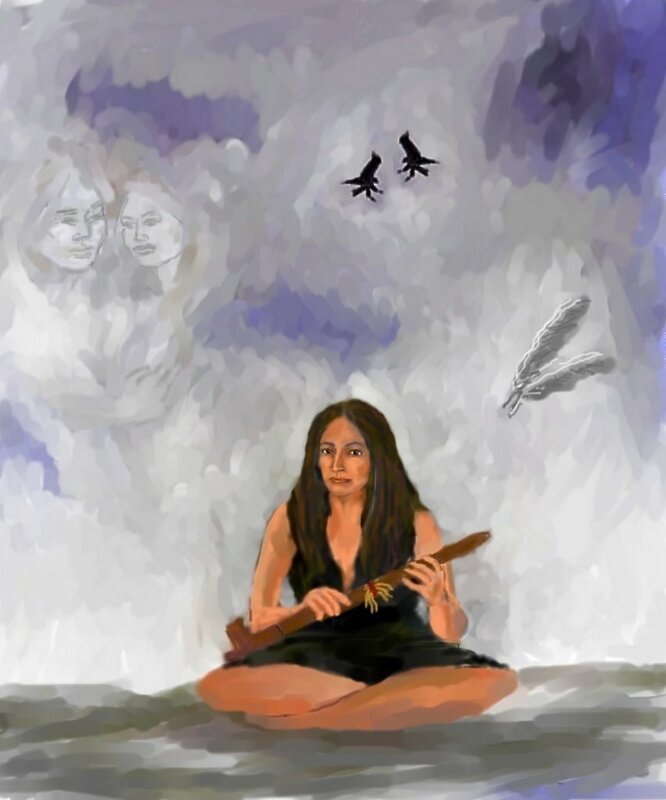 The day she told me about the dance of the hawks and what she saw as its meaning (her words follow), I asked her permission to paint my interpretation of it. She said yes. The time was finally right. Thank you, my beautiful friend, for sharing your vision. I hope it drew to you that love for which you were searching. "I went to the back field to smoke my pipe. It was so close I felt the wind of its wings brush my cheek. It flew up in a spruce tree that was about 20 feet in front of me. There it joined another hawk. I was so hurt and disillusioned...at the time. spiraling around each other and singing and dancing. and they would have crashed to the ground. which helped them both soar. together they created a vortex." The pipe I painted here is my own from Pipestone, Minnesota, which is where red pipestone is found and pipes are still carved. The place has a good feeling to it because it is sacred space dedicated to peace. Since all of the tribes needed the stone, they would go there and not fight-- even if they were enemies away from there. To walk along the little creek, to see the red stone still on the walls, I could feel its good energy-- as I still do in the pipe I bought that day. I have yet to smoke my pipe. A person should not use sacred symbols without understanding their meaning and doing it properly. In this case one of those understandings is that once you have smoked a pipe, you encase it in leather-- maybe for the same reasons I generally wrap my Tarot cards in black silk when I am not using them. I haven't yet made a case, but that time is coming. Beautiful painting and beautiful poem, Rain. Poignant, as one who will probably never have a relationship again. I, too, have been to Pipestone and have a pipe I have never smoked. I took photos of the Native American carving it. I loved that place. We stayed in town for a couple of days I was so enchanted. The unsmoked pipe is on my altar back home. "... each doing their own dance and singing their own song..."
Truly, this is the essence of good, strong relationships. I must breathe. Give me room. Then I can be strong when you need me... Yeah, that's what it's all about. So simple, yet so widely misunderstood. I agree with Winston as to the most important part of a relationship. Each must be able to do their own thing but in a good relationship, you will both do these together. You have presented another significant post for us to "chew" on. Thank you. Beautiful painting and poem. I dreamed of hawks last night, so it was especially cool to find this post. I like the observation about how hawks fly close but not too close so they're proximity provides both the buoyancy and the distance for flight. Lovely painting and a lovely poem, too...if one can call it that. I hope she found that perfect relationship, too. I do remember something CHER said when she was being criticized constantly for doing all that plastic surgery.."I'ts my body and if I want to put my breats on my back because it pleases me...it's nobody's business!" I do agree that she is correct in that, but, I still think it is sad, in a way, that she was so unhappy with her looks...you know? Helen Mirren is a GREAT example of a woman aging gracefully! I would love to look younger and all that, but NOT at the expense of taking away my life from my face or even my hair! I don't dye my hair and never have and the other terrible problem with all that surgery is one's eyes cannot have surgery and to me the most pitiful thing to see is, someone with "old" eyes in this face that doesn't go with them! This is just what I am looking for in expressing myself to someone who is clipping my artistic wings. Maybe we can soar in a group show I doubt it. I have a firend from Pipestone, I sent this to her to read!